I posted my nail polish collection last year (click HERE for that post) and I wanted to share just how much I’ve downsized yet again. I showed a pic of how I downsized in my ‘Beauty Corner’ post (click HERE for that), but I’ve downsized yet again. My set up is still the same as my initial nail polish collection post. 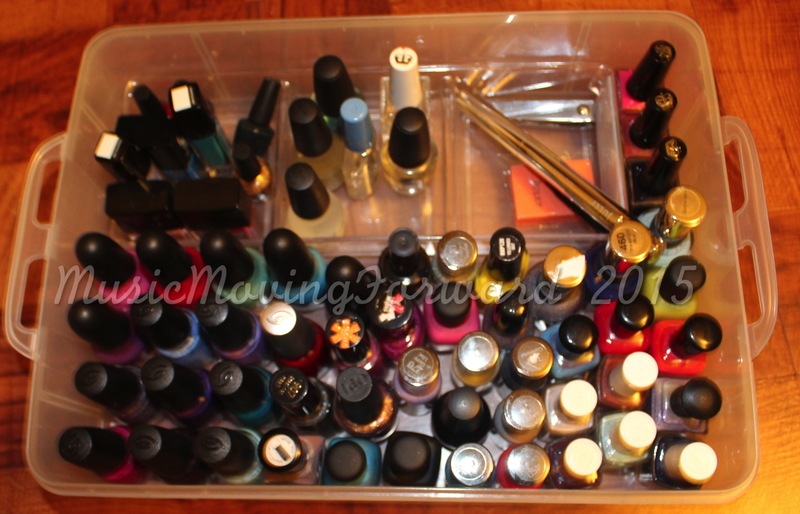 I still store in the Snapware containers (click HERE to purchase) and I’ve added a 3 compartment organizer for smaller nail polishes among other things. I’ve also included links to all of the polishes I could find (click each name individually) plus my TOP 10. Enjoy! I need to de clutter mine so badly! I had three tubs full compared to what is shown. I got so attached to the polish I didn’t want to give it away lol. This time decluttering was easy. I just tossed what I didn’t love.